Here on the blog and That God Show, we’ve talked quite a bit about the concept of hell and have gone in-depth as to why I believe hell is not a biblical teaching. Yet, even using scripture as the foundation for a hell-free eschatological and theological viewpoint, many Christians are completely unwilling to reconsider their views on hell in light of what the Bible teaches. Why this is the case, I have no idea. 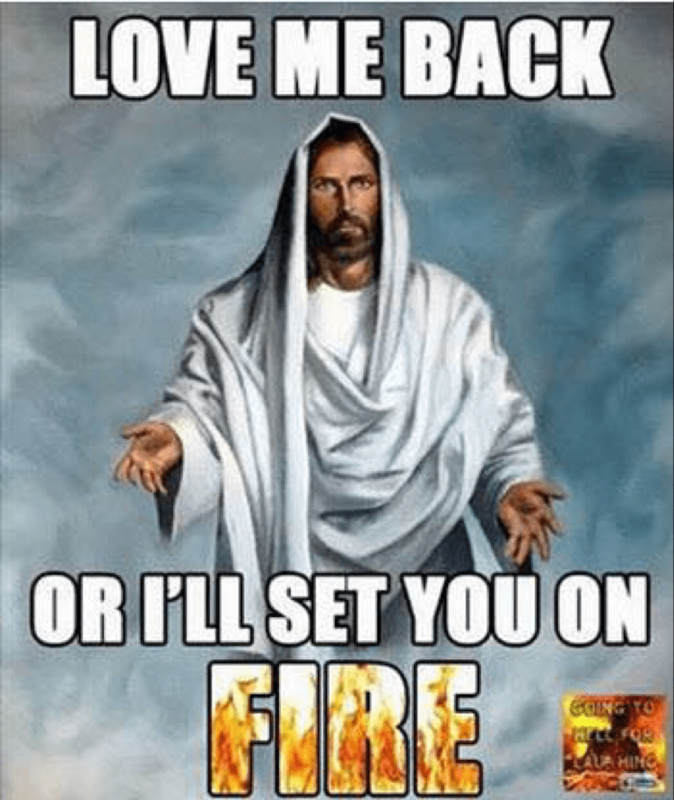 One would think that folks would flock to the opportunity to let go of hell, but apparently the traditional doctrine on hell is a beloved doctrine of many Christians. My interaction with Christians who believe this has led me to a question. An important question. A question I ask in all sincerity as the first installment of my new series, Sincere Questions. Which one of your children would you be willing to torture with fire? If God is altogether wonderful, beautiful, and all-loving, it would follow that everything he does is wonderful, beautiful, and all-loving. Therefore, there must be something wonderful, beautiful, and all-loving about torturing people with fire and preventing them from having any escape from the pain of those flames. If torture with fire is anything less than wonderful, loving and beautiful, God would be less than wonderful, loving or beautiful. So, which one of your children would you be willing to torture with fire as a punishment for not loving you back or misbehaving? and go to town on them? My teenager once told me she hated me and wished I wasn’t her dad, and I have to admit, setting her on fire didn’t cross my mind because I loved her in that moment anyway. Is there anything your child could do that would cause you to turn them over to ISIS to be punished by burning? That’s an important modern connection, because given the traditional doctrine on hell, the only people I see mimicking this version of God, is ISIS. Is there anything your child could do that would make you lock them in a dark room, turn up the heat until it burns their flesh, and then gleefully listen to their screams for the rest of their life? I can’t imagine you would, because that’s both sick and evil. I’ve met a lot of crappy parents in my life, but I’ve never met anyone who would do that to their own child– anyone who would do so would rightly be considered either mentally insane or depraved in an especially disgusting way. Or, what if God allowed you to sit on his throne and judge your own children– giving you the authority to determine their eternal fate. Do you have any wayward children you’d pick to be sent to hell? Or, would you show them a lavish grace and mercy that flowed from your love for them? I think I know what you’d do. Are you more loving than God? Because you love your children so much you’d never do that. Are you more merciful than God? I’m assuming you find the image of your own child being eternally tortured by flames to be an unbearable image– one that would leave you crying and screaming for someone to show mercy. This of course, begs the ultimate question: How could we be more loving and merciful than God? I don’t think we could– but if hell is real, most of us certainly are more loving and merciful than God. And that right there is a good sign we need to rethink our ideas about hell– because I believe God’s ability to love will dwarf ours any day of the week. And so this is my question for you, my hell believing friends: which one of your own children would you be willing to subject to torture by fire? If you are too loving and merciful to do that to your own children, why do you believe God is less loving than you are? I ask in all sincerity that you ponder this, because if you really think it over, the traditional doctrine of hell should lead to some very, very troubling conclusions about God– conclusions that I believe must be strongly rejected. PrevPreviousDon’t Fear The “Homosexual Agenda”, It’s The Ammosexual Agenda That’s Concerning. The only hell I believe in is this earth. The biblical teaching is such an abusive teaching and I don’t know how anyone can believe there deceased loved ones could possibly be suffering in hell right now whether they followed Jesus or not. I do believe in life after death and some sort of creator but in my beliefs sin is an illusion created by man to get people to go against homosexuality and your whole religion is a lie to mind control you. It wouldn’t make sense for a responsible and almighty creator to let most of their creations to go to waste and claim they chose to suffer whether they followed him or not. God cannot be called almighty if anyone was recieving eternal torment in their after life. THE ABOVE IS JUST ONE OF THE MANY ANSWERS TO YOUR QUESTION (S)! NOT EVERYONE of us walking this earth is a CHILD of God (there are prerequisites to being a child of God; just being a human ISN’T ONE); and you already know the implications that subscribes to. Very funny and ironical !! !